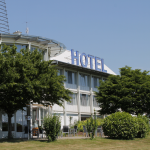 We look forward to welcoming you as our guest at the Hotel Schwanau. Central and quiet location close to the A5 motorway, easy parking. Arrive, enjoy the peace and quiet and start the day with a good breakfast. Whether you are traveling on business, just passing through or want to spend a few days exploring our beautiful area….we offer you a warm welcome! Cyclists can lock away their bikes overnight. The Europa Park Rust can be reached in 15 minutes. Strasbourg with the beautiful cathedral and the European Parliament can also be reached in 30 minutes. In 45 minutes you are in the heart of the Black Forest. The Vogt farms in Gutach, the Triberg Waterfalls as well as other attractions are well worth a visit. The Hotel Schwanau is classified as a 3-star hotel garni according to the criteria of the European hotel classification system. In 2014 we received an award in the Ortenau District’s“Beautiful Guest House“ competition. 24 double rooms are available. 2 of them are wheelchair accessible. In 8 rooms an extra bed is possible. All around Schwanau our region offers many beautiful things to see and do..